Bahia Principe Cayacoa Review: Gran Bahia Principe Cayacoa is located between the Bahia Samana and the Bahia Escocesa overlooking the pristine white sand beach available exclusively to the guests of the resort. More impressively, the resort looks out over an area of the Caribbean renown for its seasonal star visitors, the humpback whales. Humpback whales return yearly to the area to mate, delighting guests at the Gran Bahia Principe Cayacoa. The resort offers two panoramic lifts to help guests appreciate the majestic views that make this spot so special. The healing power and beauty of nature surround you while you stay at Gran Bahia Principe Cayacoa. The lush gardens, soothing marine waters and vibrant marine life really are a draw to the resort, and once you arrive at the resort you will realize that the exquisite service and luxurious resort amenities are the perfect compliment to the natural wonders of Samana. Gran Bahia Principe Cayacoa offer delicious food, great entertainment and finely appointed accommodations. Spend your days by the pool, in the open air Jacuzzi or sprawled out on the private beach, soaking up the warm Dominican sun. 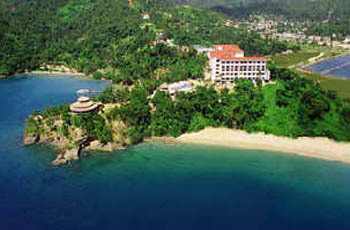 Samana is a hub of activity on the resort and off. Great Excursions such as whale watching tours and tours of nearby islands and towns as well as deep sea fishing and other adventure tours have been many vacationers’ major motivation for choosing the area for years. The local town is also a great spot to soak up Dominican culture, with authentic restaurants and quaint shops, visitors will be delighted by Samana’s vibrant personality. Bahia Principe Cayacoa Review Accommodations: With 209 Standard rooms and 86 Junior Suites with Ocean View distributed in the main building and in two different Villas on the complex Guests will find what they are searching for at Gran Bahia Principe Cayacoa. Each of the Villas is located in a spectacular setting with direct access to a pool. 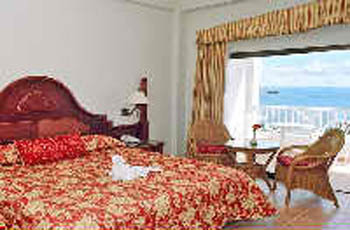 All rooms are air-conditioned and equipped to make your nights comfortable and your visit carefree. Bahia Principe Cayacoa Review Activities: While you stay at the Gran Bahia Cayacoa you have access to two tennis courts, paddle tennis courts, a full gym and spa. Take part in an aerobics class or try one of the many different water sports offered in the pool or at the beach. The Resort also has two pools with towel, umbrella and parasol service, hydro-massage pool and open air Jacuzzi. Towel, lounge chair and parasol service is also available at the beach. 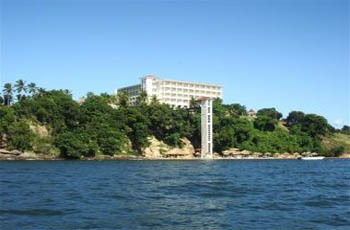 The resort houses small shops and a Casino. You will want to try the fabulous excursions offered in the area such as Whale Watching, Deep Sea Fishing, Island hopping and Scuba Diving among others. 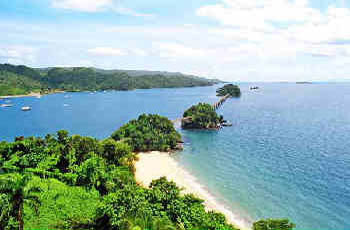 Samana is an Eco-Tourism destination, the possibilities are endless. Bahia Principe Cayacoa Review Spa: The spa offers a variety of health and beauty treatments to help replenish your weary self while on vacation. Choose from a variety of face and body treatments, water treatments and beauty treatments. Hair services, pedicures and manicures are also available. Bahia Principe Cayacoa Review Restaurants and Bars: Gran Bahia Principe Cayacoa offers four different restaurants including one buffet and three specialty restaurants. The specialties of each of the restaurants include Italian, Mediterranean and Gourmet. The Gourmet Restaurant is located at the top floor of the central building which means that it had spectacular views of the bay- a perfect spot for a romantic dinner. Three Specialty meals per week of stay per guest are included in the all inclusive package. Reservations are required at the Specialty Restaurants. The Resort offers three different bars, including a Lobby Bar, Snack Bar and Pool Bar. Bahia Principe Cayacoa offers everything you are looking for in the perfect vacation for your family, a romantic getaway, a soothing retreat or maybe you are simply looking for paradise. Anxious for your trip to Cayacoa Samana? Hit any of the "Get Quote" buttons on the page and we'll send you a booking confirmation form or give us a call toll-free and we'll answer any questions you may have. Let's make that dream vacation a reality - join the Punta Cana Information Guide Family. Do your own Bahia Principe Cayacoa Review this season!